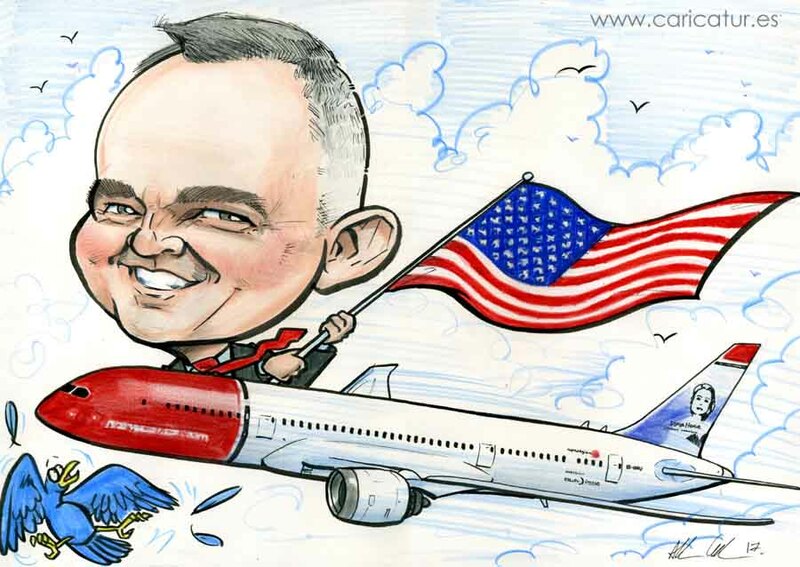 Gift Caricature for Norwegian Air Transatlantic Flight from Cork! Gift Caricature marking first Transatlantic Flight from Cork Airport! This was a gift caricature for the head of communications in Cork Airport to mark the first direct transatlantic flight from Cork Airport last month. It was a tight turnaround (this things usually are) but I got it there in plenty of time and the client was delighted. An historic day for Cork too, making it the first port of call for lots of tourists flying in from across the Atlantic. Maybe they’ll get to order a gift caricature from me while they’re here! If you’d like to order a gift caricature you can visit my Caricature Gift Order page. Aviation history was made at Cork Airport today with the departure of Norwegian flight D81821 from Cork to Boston/Providence – the airport’s first ever scheduled transatlantic service. The new transatlantic service will operate three times per week, linking the South of Ireland region to the Greater Boston, Rhode Island and New England areas. The long-awaited opening of the new route will lead to greater travel, trade and tourism between the two regions. Speaking at the inaugural ceremony, Niall MacCarthy, Managing Director at Cork Airport, thanked the team at Norwegian for partnering on the long and hard journey to deliver new direct transatlantic service from Cork to Boston Providence. “I would like to thank especially all of our stakeholders, on both sides of the Atlantic, who assisted us with their support to secure the granting of the licence,” he added. “I also want to acknowledge the wider team here at Cork Airport, across our own and many companies, who work seven days a week, fifty two weeks of the year, to deliver outstanding customer service to all of our passengers. I am proud to say that this great service from all our staff was recognised recently when Cork Airport won the ‘Best Airport in Europe’ award of its class at the Airport Council International Congress in Paris earlier this month. “The official history of Cork Airport was last published in 2011 in a book entitled ‘Fifty Years Have Flown’. Today I am very proud to say that a new chapter can be added to that book and Cork Airport is now Ireland’s and Europe’s newest transatlantic airport. Staff Parties – Live Caricatures from Avvio Summer BBQ, Limerick Strand Hotel!